I am sure you have heard the buzz on inflammation and/or an anti-inflammatory diet? This buzz is picking up momentum and for good reason. Chronic, unmanaged inflammation in your body can (and will) wreak havoc on how your feel, look, age and just might put you at risk for some serious chronic diseases. Unfortunately, the standard American diet (SAD) is full of inflammatory foods and our modern day lifestyle tends to add to this fire. However, it is not all bad news because there are many simple lifestyle shifts to decrease inflammation and cool that inner fire. Tomorrow Dr. Kristin Lum, N.D. and I are going to dive into this topic in a free webinar, Wednesday, April 12th at 11:30am MST. We will go through our favorite tips to cool chronic inflammation plus leave time for a live Q&A. Join us by clicking HERE. 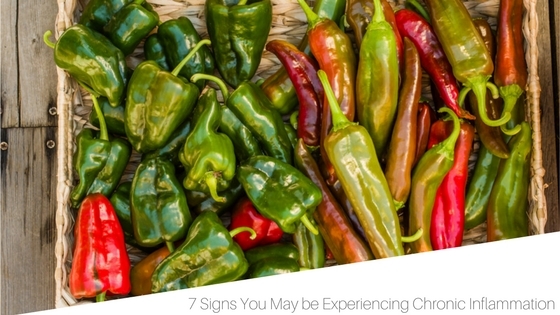 Here are a few common signs that you just may be experiencing chronic inflammation. Now, don’t go and doom yourself with these symptoms but feel empowered knowing that lifestyle shifts dramatically impact inflammation. Your body is constantly giving you signals and these signals are critical to note for optimal health. They are important messages in how to find balance. Start to ask yourself, what makes me feel inflamed. Does the way I live, eat, work, sleep and move create or cool inflammation? Yes, we are all a little tired but do you feel exhausted for no good reason? Now depression is not solely caused by inflammation, however research is starting to show some very interesting connections. Do you have unexplained mood shifts, brain fog and/or depression? Constipation, gas, bloating, and/or diarrhea are all signs something is up with your digestion, gut and diet. An unhealthy gut is a breeding ground for inflammation. Your skin is your largest organ and skin issues are an outer signal that you have an inner fire. Are your achy joins holding you back from doing what you love and/or getting around with ease? Achy, painful joins are inflamed joins. Do you hold your weight around your midline? Do you have trouble loosing it? Excessive fat cells in your middle increase the inflammatory response. Feel extremely overwhelmed and over-loaded? Stress is an inflammatory state. If you identify with any of these signs and/or are interested it creating optimal health & wellness through lifestyle habits lets book a free 30 minute nutrition consultation. You can do that by emailing me directly wholehealthlab@gmail.com.